By default, in its Page titles report, Piwik uses the content of the <title> tag of the specific URL. But if the page titles are optimized for SEO or for some internal pages even missing report become unclear. Piwik gives its users the opportunity to set custom page titles which are only visible in Piwik reporting. So for any URL we select, we can set a clear and meaningful custom page title. There is no need to set up anything in Piwik web platform. 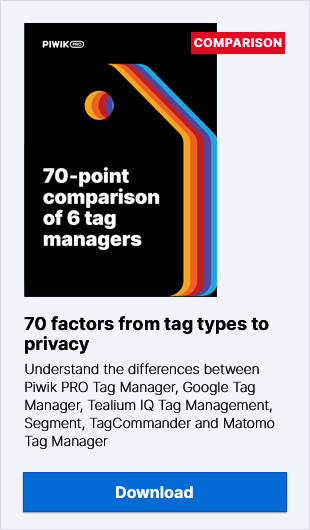 Everything will be configured on the backend – in this case in the Piwik PRO Tag Manager Tag Manager. Without Piwik PRO Tag Manager we would have to bother our IT team and get them to edit the code – in this case the <head> section – of the particular URLs in question. Since most of the pages are configured with page templates, modifying the section changes things across all the pages. And because of this, it would be necessary to use some custom coding to extract specific pages. Happily, with Piwik PRO Tag Manager you can do this quite easily by yourself. we will create two tags, pretty much identical, but we will talk about that later. Which will insert a combination of the domain name and page title into Page title report. For the second tag the value will be “Contact Page”. Now Save the trigger configuration and again Save whole tag. To see how this looks in Piwik, we can look at the changes in Page titles report (one of the Actions Reports). We have to visit the home page and contact page to generate some new page views. Remember that if you have your IP excluded from the reports, you will have to use some VPN software to be able to see the page views which you generated. But, we should mention one point about this configuration which you should be aware of – two page views have been duplicated (with original title and custom one). We have only visited each page once. So why did this happen? snippet to track page views. Without it, Piwik will not show any data in the reports. But now with our new method which is changing the title in the report, we have executed this action again, so we have a duplication. We can’t delete the first occurrence of the trackPageView because this would mean that all the other (besides new tag with custom title) data wouldn’t be tracked. We can’t add a new tag before the main one, because the main Piwik tag calls for others which are necessary to make the tool work correctly.